Located closed and snug in the hills of Ubud is a beautiful villa that overlooks the rice paddy fields alongside the Ayung River. 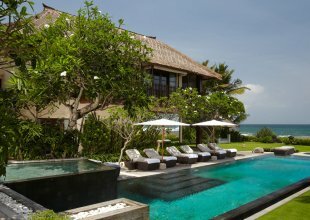 This Luxurious Villa is a great Bali retreat to experience just 7 miles from the center of Ubud. Villa Hartland consists of four suites made from restored teak wood houses, with grass roofs, a large double bedroom, an elaborate bathroom, and spacious wooden deck with available space for yoga and lounging purposes. The Fourth Suite however is designed differently with a larger living and dining deck just outside the double bedroom. A separate dining area is located on top of the Pool House, which offers an amazing view out towards the sunset, across the ocean, through the Ayung river and the rice fields. The Pool House and its immediately vicinities are made from restored teak and old Ulin. 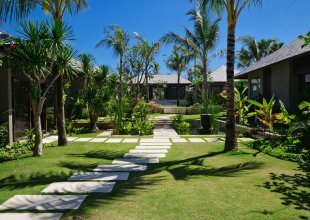 The stones in the Pool house were taken from Sumba Island. There are two gazebos perfect for meditation which are further along down the hillside towards the gardens, that also features amazing view of greens. Water is pumped from an all-natural spring to the pool, gardens, ponds, showers and all the area where water is needed.